Unless you're an interior designer, you probably don't spend much time thinking about curtain rods. When the time comes to install one, therefore, you first will have to consider a number of factors. You'll have to determine which type of rod to use, its length and height above the floor, and the actual installation hardware and procedure. Despite these details, curtain rod installation is a DIY-friendly project for anyone with a drill, a ladder, and an hour or two to spare. A curtain rod should be long enough to allow the curtains to hang beside the window. You have options when it comes to curtain rods. You can choose a conventional telescoping rod with decorative end pieces – called finials – or a curved rod that screws directly to the wall and maintains an air space between the curtains and the windows. You can also choose a curtain track with pre-installed gliders, which is ideal for draperies and full-sized, heavy curtains. Finally, if your curtains are light, you might consider mounting them on a tension rod that fits inside the window frame. Tension rods are the easiest rods to install, but they tend to slip when subjected to any downward force, such as the kind your cats might exert when climbing them. Make Sure It's Long Enough – One of the most common mistakes homeowners make when choosing curtain rods is to fail to allow enough length to allow the curtains to completely clear the window when they're open. To avoid having your curtains permanently covering the edges of the window, you should allow an extra 10 to 15 inches on both sides of the window. For example, if you have a 3-foot window, your curtain rods should be approximately 5 feet long. In most cases, you'll be attaching the curtain rods to the wall over the window, not to the window frame itself. 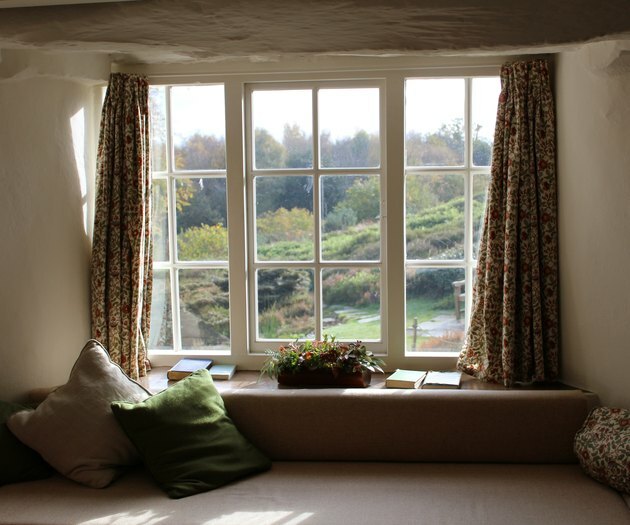 The higher you hang the curtains, the taller the window appears, but, on average, the rods should be between 2 and 4 inches above the top of the window. The length of the curtains is also a factor. You want to position the rod in such a way that the curtains just touch the floor or the windowsill or hang about 1/2 inch above it. This may require setting the height a little outside the 4- to 6-inch range. 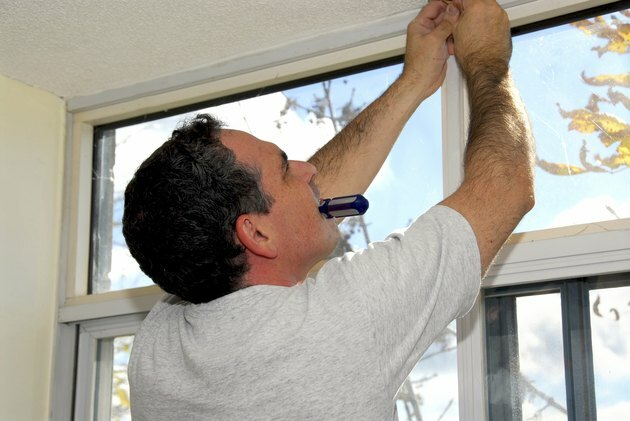 In most cases, you'll be driving screws directly into the drywall to hold the brackets for your curtain rod. The brackets will quickly pull out of the wall unless you first install anchors. Plastic conical wall anchors are strong enough for this job, and they are easy to use. Be sure the anchors you select are sized for the screws you're using. Anchors are sometimes supplied with the hardware that comes with a curtain rod. When installing rods on the window frame, you don't need anchors. Determine how far beyond the edge of the window the rod will extend; then make a mark about half this distance from the window and at the appropriate distance from the floor. Hold the bracket against the wall at that location and, with a pencil, make marks for the screw holes. Drill a hole on each mark and tap in an anchor; then screw in the bracket with a screwdriver. Support one end of the curtain rod in the bracket you just installed; then lift the other end until the rod is level. Place a spirit level on the rod to help you determine this. Make a mark for the second bracket the same distance from the window as the first and just behind the level rod. Install the second bracket the same way you installed the first. Set the curtain rod on the two brackets and center it. Fit the middle bracket onto the rod and set it on the wall. Mark the screw holes and remove the bracket; install anchors and screw the bracket to the wall. Remove the rod and thread it through the hangers on the curtain. If you're installing a track rod, you don't need to do this because you can just insert curtain hooks through the eyebolts on the gliders. Set the rod into the brackets and tighten the screws on each bracket – using a screwdriver – to hold the rod securely.